It is autumn. Bright summer has softened to a diffused gold and the air turned brisk and invigorating. At this time of year Seattleites abandon their brief flirtation with optimism and return to resolute melancholy. Each dazzling fall day framed with golden leaves must be savored, for it will surely be the last and give way to endless grey and drizzle. Such is life, they sigh, doubling the daily prescription of americanos, haunting ballads, and microbrews. For the culinary minded, this pessimism is compounded by the gradual closing of farmers markets and the end of tomato season. No more bulbous heirlooms, jewel-like cherries, or pinky plums will graces market tables and those craving the swelling fruit must content themselves with Mexican impostors, pale and insipid. Only the most resolute will continue picnicking into October and barbecues will soon be cleaned and packed away for another nine months. The general mood is one of resignation; it was good while it lasted. I must not be a true Seattleite, because I am cheered by the waning tilt of earth. After the closeness of summer, after the scrutinizing sun and the season’s admonition to be out-of-doors, the chill air is a refreshing tonic. After months of languishing under the bodily pulse of growth and greenness, my mind wakes up again. I can think again. I read books and feel an urge to learn things. And unlike many cooks I welcome the end of summer. I have overdosed on salads and even the most scarlet tomato has lost its allure. Instead I dive into butternut squash, mushrooms, and my beloved apple. Bring on the soups and stews, the roasted vegetables and heavy red wine. In honor of fall, I have made a fruitcake. Not an airy fairy fruit-flecked sponge; not an exotic huckleberry inspired torte. No, this is a traditional fruitcake, the kind that calls for several pounds of dried fruit, a good measure of brandy, and a thick coating of marzipan. It is a cake that delivers calories, the ideal provision for a long hike or a day on the slopes. It is a cake with purpose and character; one might conquer Everest with this cake. Today my efforts were finally rewarded. Breaking the cake’s ivory surface, I carved out a slice and bit into it. 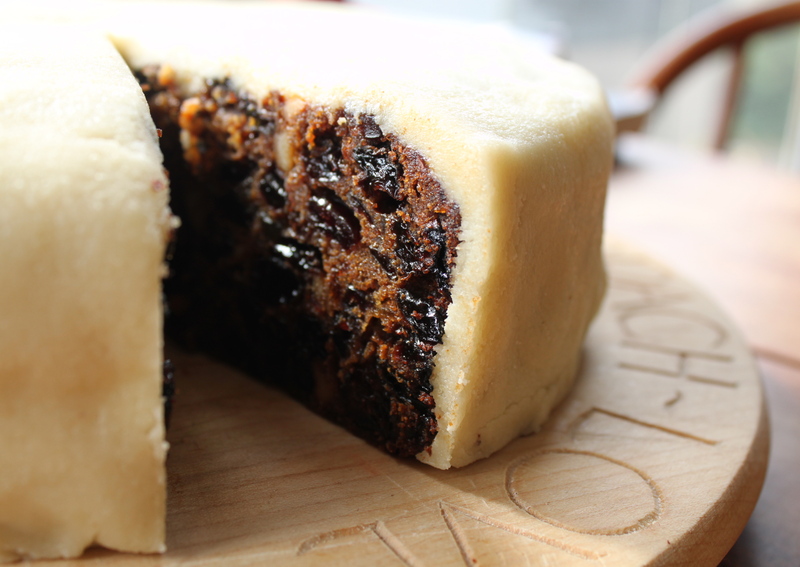 Beneath its pale blanket of marzipan the fruit was dense and earthy, almost black. It repelled light. It was moist and fragrant, chock-full of dark and golden raisins, cranberries, almonds, and little chunks of crystalized ginger. And the whole was infused with a rich brandied warmth. It is a cake to bolster body and soul during even the most foul Seattle weather. Proper fruitcake is easy to make but it does not provide instant gratification. In addition to the usual mixing and baking, it must then be fed with brandy (spooning some liquor over the cake) daily for a week. Then you make some marzipan, roll it out, and cover the cake. You can also finish it with royal icing, although I prefer simply marzipan. Thanks to the high proportion of fruit and alcohol, this cake will keep for several months so long as you wrap it in foil and keep it in a tightly sealed container. In England, fruitcake was traditional wedding fare and the top-tier was set aside to be eaten at the first child’s christening. The cake will darken and the flavor will improve with age. 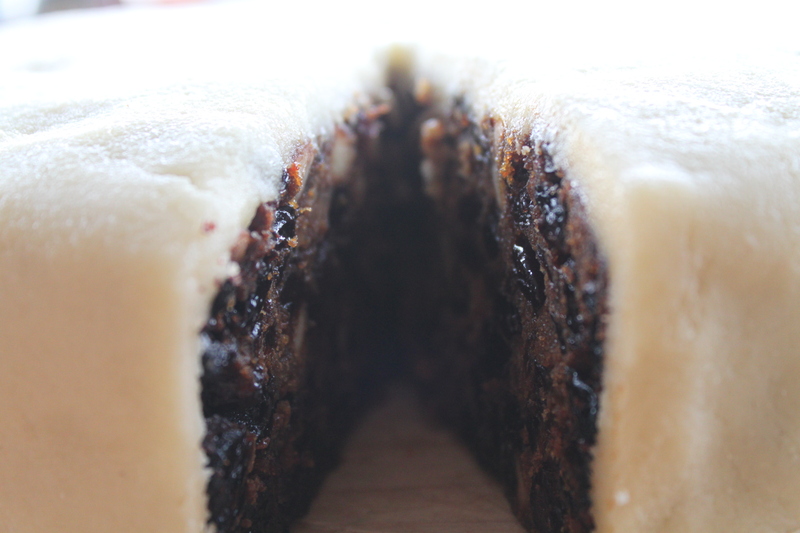 This is adapted from the BBC Food Christmas cake recipe. 1. Heat the oven to 150C/300F. 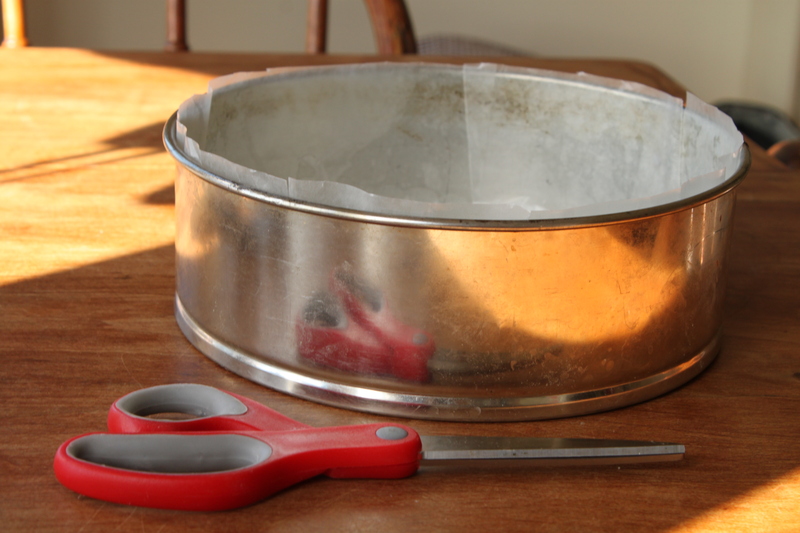 Grease a deep, 20cm/8-inch round cake tin and line the bottom and sides with parchment paper. 2. Sieve the flour, salt, mixed spice and cinnamon into a bowl. 3. Cream the butter and the sugar in a large mixing bowl and then mix in the sugar, treacle, marmalade and vanilla essence until light and fluffy. 4. Mix the eggs a little at a time into the mixture adding a tablespoon of flour mixture with the last amount. 5. Fold in the remaining flour mixture until well mixed and then mix in the dried fruit, crystalized ginger, and almonds. 6. Turn the mixture into the prepared tin and make a slight hollow in the centre. 7. Bake in the oven for 2.5 – 3 hours and then test with a skewer. If not ready bake for up to another hour testing every 20 minutes until the skewer comes out clean. 8. Remove from the oven, leave to cool for 15 minutes, and then turn out on to a wire rack and cool completely. 9. Once cool, make a few holes in the cake with a skewer and brush or spoon 1/4 cup of brandy over the cake. 10. Store the cake wrapped in foil and in an airtight tin or plastic container. Brush a little brandy over the cake each day for one week. 1. 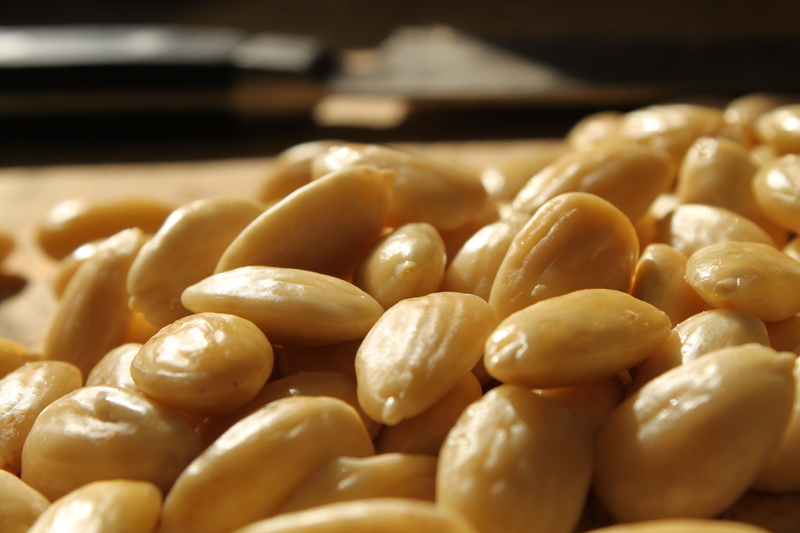 Grind the almonds to a fine texture in a food processor. Add the confectioner’s sugar and salt and process until combined. Then, add the egg and almond extract and pulse until the mixture just comes together into a dough, adding a little more egg white if necessary – but take care not to add too much egg or your marzipan will be too wet! 2. Divide the marzipan into two balls, roll out one into a round the size of your cake, and carefully place it over the cake. Roll the second ball into a sausage shape and press it out into a long, skinny rectangle the width of your cake’s side. Carefully wrap it around the cake like a belt, trimming where necessary, and press the upper edge together with the top round of marzipan. 3. 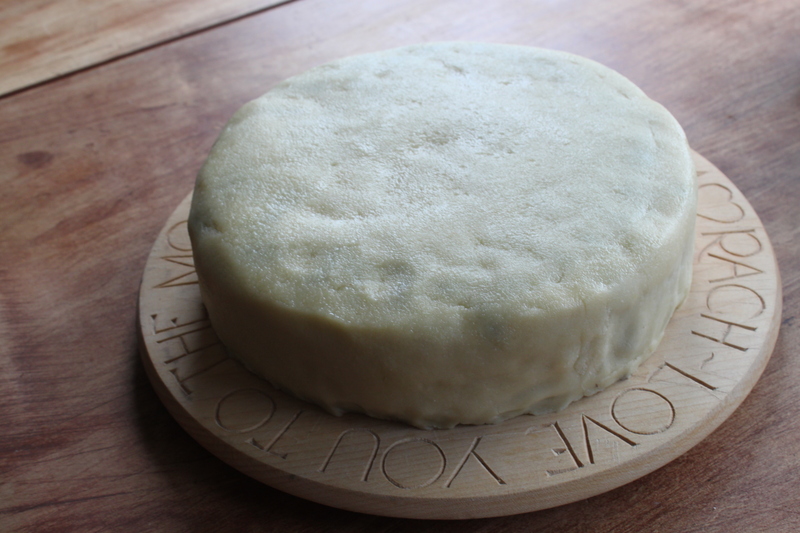 Smooth the marzipan with the side of a warm damp knife or spatula. This is it for me, although most people then finish the cake with royal icing. Proper fruitcake is at its best eaten outside, in rough autumn weather, washed down with a dram of whiskey. No matter how squelchy your boots, this repast will immeasurably improve your existence.